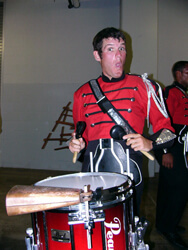 Nineteen-year-old Jason Burris, a third-year member of the Boston Crusaders, explains the different percussion implements that the snare line uses in the corps' 2007 Spanish-themed program "A Picasso Suite" in an an interview with DCI.org's Christina Mavroudis. "I really looked forward to an opportunity to play (the cowbell). Everyone has a snare drum in drum and bugle corps, but not many people have been able to play a snare drum and a cowbell simultaneously. So I was very excited about this experience." Listen to the audio interview. (MP3) Watch the Boston Crusaders play with "more cowbell" on Sept. 5, 2007 at 10 p.m. Eastern time during the DCI World Championship television broadcast on ESPN2.